Here’s a highlight among the music and table tennis videos that we simply HAVE to show you. Marteria and Casper – two German rappers (okay, for all of you who speak German, they need of course, no introduction 😉 ) – have teamed up to make an album together. 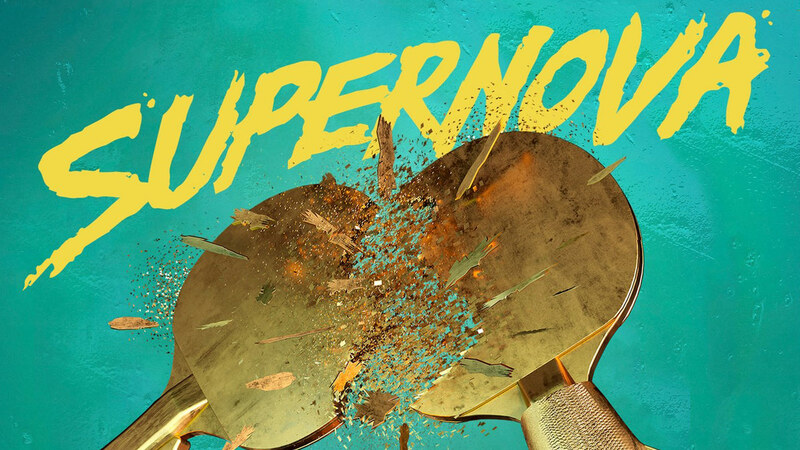 Supernova is the second single from the ‘1982’ album. Not only do the two perform a great song, but go one further by adding a hilarious music video. Casper and Marteria face each other in what is likely the hottest table tennis match of the year. The two fight out an epic battle to utter exhaustion. In an absurd stage set, fantastic clothes and some rather over-enthusiastic fans they match up across the table tennis table. They have packed the three-minute video with so many gimmicks you can hardly keep up with rapid stream of gags. From a falcon, lama, table tennis bat with a fish handle, table tennis gold chain, flying beer cups to a mad exchange of balls and spurts of blood everything is in there, and lots more besides. The video has virtually nothing whatsoever to do with the lyrics or music. However, it is entertainment, pure and perfect all the way.